[165 Pages Report] The network forensics market size is expected to grow from USD 1.25 Billion in 2016 to USD 2.69 Billion by 2021, at a Compound Annual Growth Rate (CAGR) of 16.6%. The base year considered for this study is 2015 and the market size is calculated from 2016 to 2021. In today’s business environment, the implementation of new technologies has created a few problems for network forensics investigators with regards to collection of digital evidences. The digital evidences documented in the network forensics must be solid and accurate, so that they can be legally acceptable. Cyber criminals use multi-layered cyber-attacks to monitor the networks across enterprises and even nations. Traditional security solutions cannot adapt to the changing conditions of the networks and handle new attacks. Only, next-generation security solutions such as IDS/IPS, SIEM, packet capture analysis, firewalls, log management, and others are able to provide exact monitoring of the network traffic. An increasing need for in-depth analysis of data across networks and extracting actionable digital evidences is responsible for the growth of next-generation network forensics products and services. The research methodology used to estimate and forecast the network forensics market begins with capturing data from various industry associations and consortiums, such as SANS Institute, Department of Defense (DoD), Information Systems Security Association (ISSA), and SC Magazines; and other sources, such as company financials, journals, press releases, paid databases, and annual reports. The vendor product and service offerings are also taken into consideration to determine the market segmentation. The bottom-up procedure was employed to arrive at the overall market size from the revenue of the key players in the market. After arriving at the overall market size, the total market was split into several segments and subsegments, which were then verified through primary research by conducting extensive interviews with key people, such as Chief Executive Officers (CEOs), Vice Presidents (VPs), directors, executives, and cyber deception technologists. The data triangulation and market breakdown procedures were employed to complete the overall market engineering process and to arrive at the exact statistics for all segments and subsegments. The breakdown of primary profiles is depicted in the figure below. The network forensics market ecosystem comprises major vendors, such as IBM Corporation (New York, U.S.), Cisco Systems (California, U.S.), FireEye (California, U.S.), Symantec Corporation (California, U.S.), NETSCOUT Systems (Massachusetts, U.S.), EMC RSA (Massachusetts, U.S.), Viavi Solutions (California, U.S.), LogRhythm (Colorado, U.S.), NIKSUN (New Jersey, U.S.), and Savvius (California, U.S.); service providers; and system integrators. Other stakeholders include network forensics solutions providers, consulting firms, IT service providers, value-added resellers, enterprise users, and security & access management technology providers. In February 2017, RSA unveiled RSA business-driven security architecture, with a new way to help enterprises with managing cyber risks and protect their network form advanced cyber-attacks. In October 2016, Arbor Networks Inc. (a security division of NETSCOUT) enhanced its Networks Spectrum platform with the addition of NetFlow packet and threat intelligence capabilities to better analyze the network traffic. In October 2016, Niksun launched its data analytics platform, NIKSUN NikOS Everest, the platform provides highly flexible, automated views on the network packets, and helps to monitor network traffic. Detailed analysis and profiling along with vendor DIVE matrix to get detailed information regarding their competitors on the basis of their product offerings and business strategies. 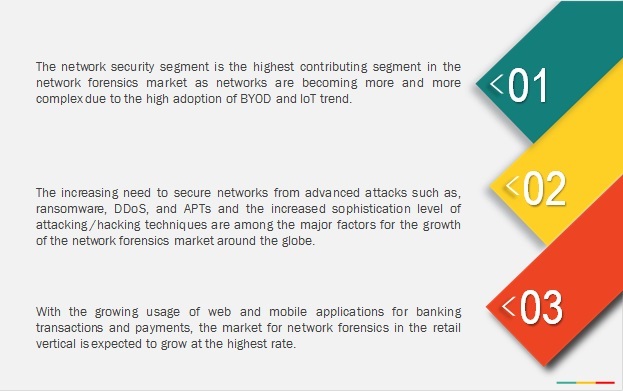 The report reviews the major players who offer network forensics solutions. Additionally, the report will outline the findings and analysis on how well each network forensics vendor performs within MarketsandMarkets criteria. The network forensics market size is expected to grow from USD 1.25 Billion in 2016 to USD 2.69 Billion by 2021, at a Compound Annual Growth Rate (CAGR) of 16.6% during the forecast period. The major growth drivers of the market include increased need to secure networks from advanced attacks, such as ransomware, Distributed Denial of Service (DDoS), and Advanced Persistent Threats (APTs); increased sophistication in attacking/hacking techniques; and need of government regulations and regulatory compliances. Network forensics deals with the collection, preservation, analysis, and presentation of the digital evidences in networks to discover the source of security breaches. Network forensics is a sub-branch of digital forensics. It involves monitoring of the network traffic with the use of scientifically proven techniques to capture the evidential information. It is a post-mortem investigation process of network attacks in many cases. Network forensics investigators use various Network Forensic Analysis Tools (NFATs) such as Intrusion Detection System (IDS), Intrusion Prevention System (IPS), Security Information and Event Management (SIEM), threat intelligence, advanced security analytics, packet capture analysis, and firewalls. The network forensics market is segmented by solution, service, application area, deployment mode, organization size, vertical, and region. The solutions segment is estimated to have the largest market size in 2016. Moreover, the services segment is expected to grow at the highest CAGR during the forecast period. The reason behind the high growth rate of the services segment is the increased adoption of Bring Your Own Device (BYOD) and Internet of Things (IoT) trend within organizations. This results in an increase in cyberattacks and creates demands for more comprehensive network security solutions and services that would help customers in securing their IT infrastructure. The data center security segment is expected to grow at the highest CAGR during the forecast period. However, the network security segment is estimated to account for the largest share of the network forensics market in 2016. The cloud-based deployment mode is expected to grow at the highest CAGR during the forecast period. The large enterprises segment is estimated to account for the largest market size in 2016. Moreover, the Small and Medium Enterprises (SMEs) segment is projected to grow at the highest CAGR during the forecast period. Network forensics solutions have been deployed across various verticals, including Banking, Financial Services, and Insurance (BFSI); government; healthcare; energy & utilities; education; IT & telecom; manufacturing; retail; and others (media & entertainment, aerospace & defense, and hospitality). The energy and utilities vertical is expected to grow at the highest CAGR during the forecast period. However, the BFSI vertical is estimated to have the largest market size in 2016. 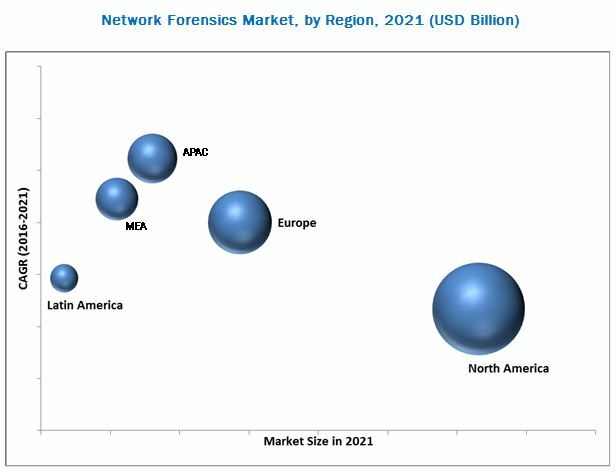 The global network forensics market has been segmented on the basis of regions into North America, Europe, Asia-Pacific (APAC), Middle East & Africa (MEA), and Latin America to provide a region-specific analysis in the report. The North American region, followed by Europe, is expected to become the largest revenue-generating region for network forensics solution vendors in 2016. This is mainly because in the developed economies of the U.S. and Canada, there is high focus on innovations obtained from Research and Development (R&D) and security technologies. The APAC region is expected to be the fastest growing region in the market. The growth in this region is primarily driven by the increasing adoption of IoT devices and BYOD technologies within organizations. The BFSI is an industry term for companies, such as commercial banks, insurance institutes, and non-banking financial organizations, which provide financial products and services. The data centers in banks and financial institutions handle large amounts of sensitive customer financial data such as payment information, money transaction details, credit card/debit card details, account numbers, trading transactions, and other critical information. Thus, this is one of the most targeted verticals by cybercriminals. The network forensics tools not only prevent the networks attacks, but analyze the behavior of the attacker with its intelligence to avoid network crimes in the future. The government vertical consists of four institutional units, namely, central government, state government, local government, and social security funds. Government agencies and institutions across the globe handle critical and sensitive information by serving citizens and collecting intelligence. Cyber-attacks and vulnerabilities have increased the security breaches in various government agencies. Attackers are targeting the networks across the government sector to breach the sensitive information regarding the government administration, departmental activities, and prime security intelligence. Network forensics vendors offer various solutions and services to this vertical to protect the valuable networking assets. Information Technology (IT) deals with the use of the computers and networking devices to produce, process, preserve, and protect various forms of the electronic data. The telecommunications sector is involved with the companies that build a communication network on a global scale with the use of phone or Internet. This vertical involves high usage of web and mobile-based applications used via endpoint devices, such as desktops, laptops, mobiles, tablets, virtual machines, and other embedded endpoint devices. Therefore, the networks in these industries are frequently attacked by cyber-criminals. To ensure the safety of network infrastructure and technological innovation, telecom organizations and IT service providers are now using network forensics solutions for the investigations. What are the new opportunities which the network forensics vendors are exploring? However, lack of skilled network forensics investigators may restrict the growth of the network forensics market. Major vendors that offer network forensics solutions across the globe are IBM Corporation (New York, U.S.), Cisco Systems (California, U.S.), FireEye (California, U.S.), Symantec Corporation (California, U.S.), NETSCOUT Systems (Massachusetts, U.S.), EMC RSA (Massachusetts, U.S.), Viavi Solutions (California, U.S.), LogRhythm (Colorado, U.S.), NIKSUN (New Jersey, U.S.), and Savvius (California, U.S.). These vendors have adopted different types of organic and inorganic growth strategies, such as new product launches; partnerships, agreements, and collaborations; and acquisitions to expand their offerings in the network forensics market.